Over the years, the kitchen has gained popularity as the central, most important room in any home. Starting from a very early morning breakfast to a late-night snack, the kitchen is always open. The kitchen is a loyal witness to many special moments. Whether preparing an important meal for family or friends, surprising a loved one on a special occasion or making a special dinner for the grandchildren, the kitchen is people want to congregate. So, when it comes to planning for a kitchen remodeling project, there are a lot of things to consider so that it will become a room where everybody will feel comfortable and welcome. At A. Leigh Construction, we want your remodeled kitchen to be a perfect combination of timeless beauty and effective functionality. A kitchen remodel can take on so many forms of style, materials and color. Let us be your partners in deciding what will work best for you. The picture on the top of this page features a kitchen that was expanded by using a screened in porch to gain space for both a beautiful marble island and a large dining area. This new kitchen functions more like a modern, open concept living space. And the picture immediately above this section shows a remodeled kitchen with a marble island perfect for gathering around with family and friends. It’s curved shape gives the stone a softer look and unique design to be envied. In the pictures that follow, you will find another classic traditional style of kitchen remodeling project. In the first, you will notice the white, shaker style cabinets. They lend to a classic, yet updated look that you will enjoy for years to come. In the second, you will notice the dining area large enough to host the next holiday meal. The exterior brick was preserved to give the kitchen a traditional, farmhouse feel. Kitchen remodeling is one of the biggest and most important changes in every home. It reflects the homeowner’s dreams, needs, style, and wishes. The perfect kitchen remodel project has a well-balanced design so it fits into everyday life. In these next pictures you will find another version of a traditional kitchen remodeling project. 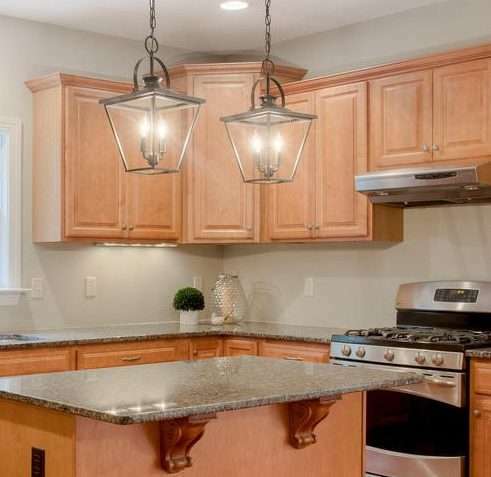 This design is complimented by warm toned cabinets and granite countertops. There is plenty of counter space for prepping gourmet meals. Notice the finishing touches. The lantern pendant lighting above the island and the beautifully detailed corbels supporting the granite make this kitchen one you would be proud to show off. In addition to kitchen remodeling, we provide other home services including bathroom remodeling, decks and screened porches, additions and mother-in-law suites, whole house remodeling, siding, doors and windows too. Contact  A. Leigh Construction today so that we can schedule an appointment to help make your Kitchen Remodeling dreams come true. The team was very professional, considerate, and diligent. They really aimed to please, consulting me at every step of the project. They were respectful of my home and family and very willing to accommodate us at all times. Many times, they went beyond the call of duty to satisfy our wishes. I was very satisfied with everything Aaron did. He was great. He completed the job, followed up, and just made everything right.